It was nice to have the weekend off for Mother’s day. When we got back to the village, the church yard looked beautiful. Villagers had mown and raked the lawn and began decorating for Mother’s Day. Also, it was nice just to be back in the comfort of our house at Lossu Village–with indoor plumbing, our own bed, my own cooking and a chance to catch up on typing some of the language texts from the course. Around nine o’clock, Sunday morning, I went out to take a picture of the group of mothers waiting to walk up a decorated path to the church. To my surprise, some of the mothers approached me and began putting fresh picked flowers in my hair and invited me to march into the church with the mothers. At first I was reluctant as I am not a mother but their kindness drew me. As I marched with these beautiful women, the oldest mothers led the way as the children began showering us with fresh made floral potpourri. One young woman placed a lei of yellow hibiscus and frangipani blossoms around my neck and said, “Happy Mother’s Day.” I was humbled. We entered the church and almost occupied all the benches. All others sat or stood where they could in the small church. As I sat there with the ladies my heart was full. When we bowed to pray my eyes glanced across to see all these rugged hard working hands of mothers folded in their laps. Hands that had ‘held fire’ just this morning: they had cooked on their cook fires and removed baked sweet potatoes from hot stones. I surmised that these women represented all women who have given of themselves in the most difficult of circumstances. They have not known much of the conveniences of life. I know that the older women were widows who have borne at least four children some of them five or six. Seated behind them were younger women, mothers who deeply cared for their little ones and still looked on with concern for older children at various stages of maturity. All of the youngest mothers look forward to days when their children would care for them–when they could no longer walk to the gardens or do for themselves. They sometimes ask me, “Who will take care of you when you grow old.” Care of older people is a real concern in this culture where there are barely hospitals, let alone homes to care for the elderly. There is no such thing as life insurance or health insurance here–only family and especially one’s children. The mother’s day message could have been preached at any church in America as it was taken from Proverbs 31 and Titus 2:3-5. There was even a history of the origin of Mother’s Day cited about an American woman who lost her mother early and encouraged the establishment of a Mother’s Day celebration on our calendars in America. 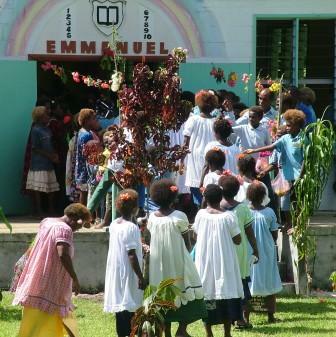 Papua New Guinea has adopted the holiday for its own. As the preacher spoke, my mind drifted to my mother who at the time lay on her sick bed having suffered a second stroke one week earlier. I was thoughtful of the one who bore me and cared for me throughout my childhood. She would always remind us saying, “You will always be my child.” I thank God for mothers and especially my own. She has lived long (83 years on her birthday, May 28) and has borne eight children, all who live to cherish and care for her.